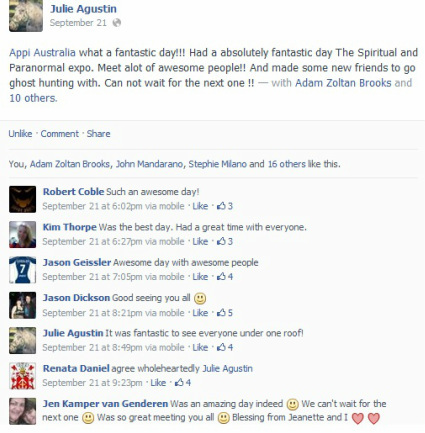 In my humble opinion The Australian Paranormal and Spiritual Expo that took place yesterday was a ROARING success. Well done to the organisers, the support team, the stall holders, the speakers and the readers who made the day an awesome experience for all that attended. It was my pleasure to be invited to MC and be involved in such an awesome event. Count down to 2015 can start now? To Peet Banks, Nic Hume and Ashley Hall, you did an amazing job and should be extremely proud of your efforts. The 2013 Expo was awesome but the test of a successful event (anything really) is the ability to do it all again and build on it. Which you successfully demonstrated yesterday flawlessly. Another congratulations to the "Ghosts of Casula" documentary production team (Peet Banks, Ashley Hall and Don Meers). An excellent Australian Paranormal Documentary. 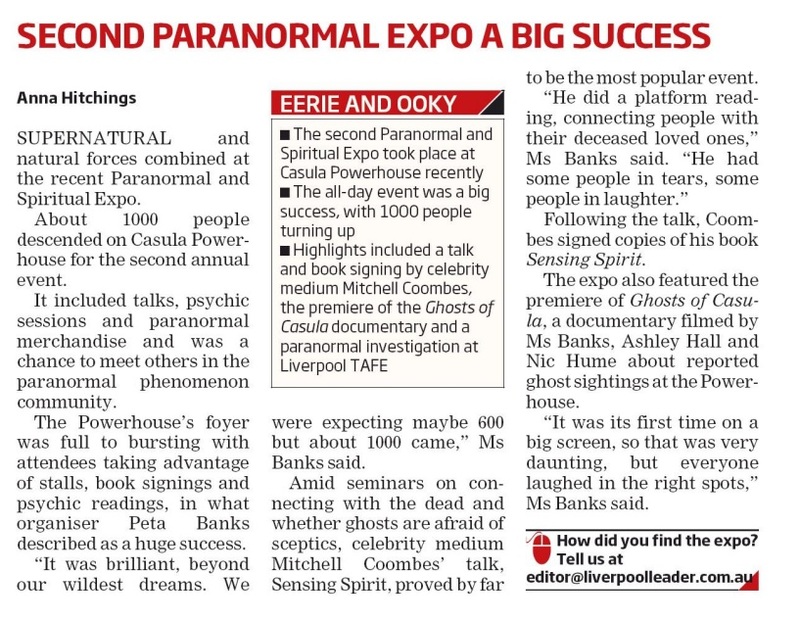 I am certain that we stand on the brink of more quality aussie paranormal content headed our way and your doco sets a new standard. Well done. It was an amazing day friends. Big shout out to EVERYONE I caught up with. All you spooky people rock my world. 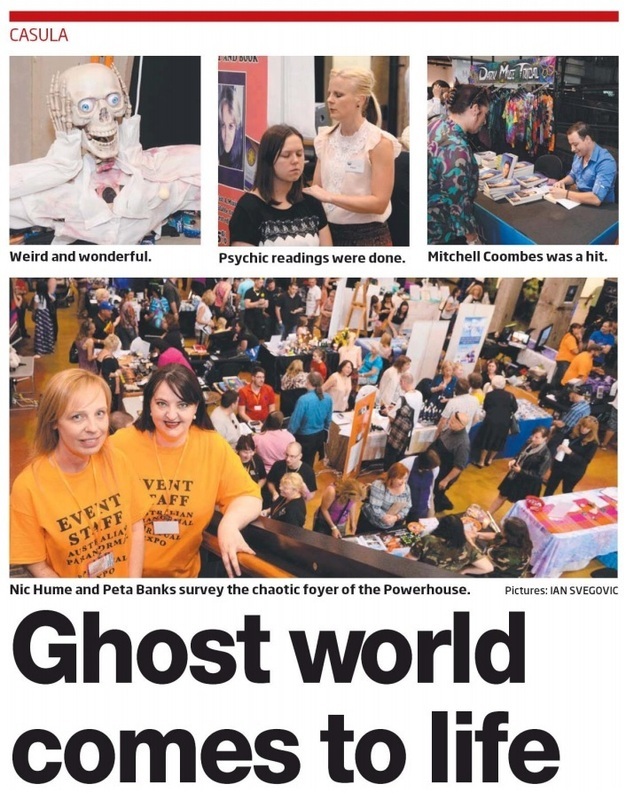 "On a whole, the Australian Paranormal and Spiritual Expo was really well organised and attended, and as a business we found it to be an event filled with beautiful energy, enthusiastic customers and helpful staff. We especially would like to thank the volunteers from APPI who were there to help us with unloading and loading for our stand. The help we received and the inquisitive, positive and fun atmosphere was what made this event out of other psychic events we've been to, our favourite so far. We highly recommend the event to everyone. Thank you team! "From the moment I arrived at the Expo I was met with an abundance of wonderful energy. Excitement filled the entire powerhouse from start to finish. All the participants did an outstanding job and everywhere you looked there were smiling faces which made everybody feel welcomed and accepted. I was extremely happy to be part of the Expo and can't wait to see what next years Expo brings! "Cory and I from Temple of Balance felt the venue was great, the size perfect, having the atm a must and the type of person coming through was perfect too. Also, I must commend all volunteers on a fantastic job - there were often questions asking if we had everything we needed, or if they could help us pack up etc. Brilliant work and atmosphere all round - count us in for the long term. Job well done! ~ Lee-Anne"
"Best expo I've ever had the good luck to attend. Atmosphere was electric. It was beautifully run. Everyone was friendly and having a good time. Met some amazing people. I just wish it was on more than once a year. Alison McDonald ~ Watersprite Tarot"
"As an exhibitor from the very first year (2013) i can honestly and proudly say; this event continues to improve and amaze me! The organisers and volunteers are all so helpful and friendly. Everything ran smoothly. I continue to be impressed and look forward to attending in the future." 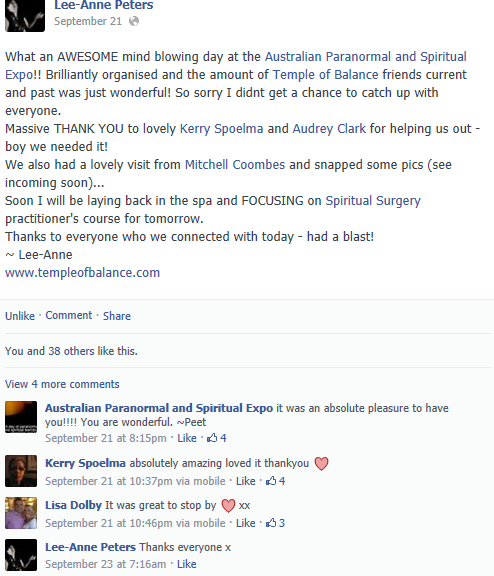 "I had the best time working at the Australian Paranormal and Spiritual Expo yesterday and I got to meet Mitchell Coombes he is so lovely in person...Can't wait for next year...You guys need to hold more throughout the year, One just isn't enough. Big thank to all the organisers for a wonderfully uplifting gathering, Paris and I, from The Creative Heart Centre, Seven Hills met lots of truly amazing people. We so enjoyed sharing, chatting and meeting new friends, blessings! Kerrie Wearing, Editor of InSpirit Magazing give a glowing review to the Expo HERE. The Skeptic Zone Podcast based an entire episode about their experiences at the Expo, it's fabulous, you can listen to it HERE. Ratbags website published a fantastic review of their time at the Expo, you can read about it HERE. The Ghost Writer Oz has reviewed her time at the Expo. You can read about it HERE. Hopefully by now you have come down to earth and had a chance to put your feet up. Many thanks for a successful and enjoyable Expo. Congratulations on a well- organized event. We managed to speak to lots of people and handed out flyers at our stand, so hopefully this will add a few people to our next meeting. It was good exposure and you certainly had an interesting variety of stalls in the hall. Thank you for inviting us and we wish you luck with any future venture you embark on. President UFO Research NSW / Exopolitics Sydney. to knowing where to go, to someone helping to unload. having a lovely day and came prepared to engage with all that was happening. definitely want to be there. Also a big thank you to everyone who helped you – they were easy to spot and friendly. If only you could run some of the other markets I am at. You delivered on what you promised. organise a friend to cover the table – I thought it was a 5 minute promo and was really disappointed not to have my chance to chat about crystals to a very interested audience! And thanks for the tip about the crystals to bring – it helped! The other table holders were also wonderful (helped by everything being made easy by you) and so friendly ... I had a great day on so many levels. 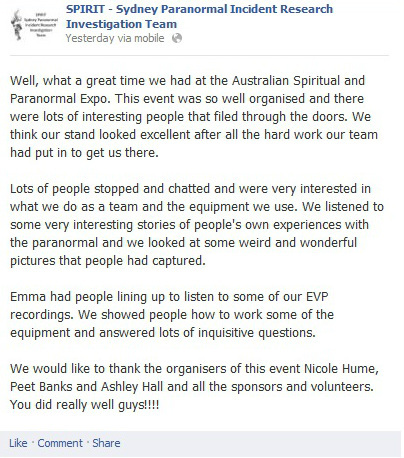 The Paranormal & Spiritual Expo was a fantastic event. Personally, I enjoyed doing a lecture and having a stand there but it was the lovely feedback from people coming through the doors that made it a tremendous day. The organizers of the event were professional and helpful and I look forward to future expo's! We are so pleased you had a successful event. It was a privilege to be at the Paranormal Expo and be part of a universe not everyone sees or embraces. Thomas and One Last Concert. The Expo is a fantastic way to channel our energies and to open the window and let others see what we have to offer them.